Circulatory disorders of the upper extremity comprise a group of conditions in which blood flow to a digit or part of the hand is significantly reduced. When caused by spasm of vessels the condition is reversible, where as true vessel blockage resulting from atherosclerotic disease can lead to more permanent circulatory compromise. 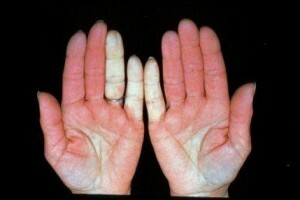 A variety of medications, together with environmental alterations, may be used to treat vessel spasm (Raynaud’s Disease). At times a surgical procedure, known as digital sympathectomy may be employed in more recalcitrant conditions of spasm. True vessel obstruction may require vessel bypass or stenting.